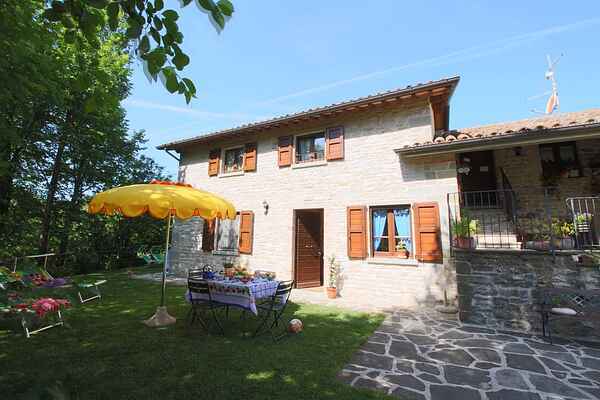 This beautiful rustic country house is situated at 700 meters altitude in the mountains overlooking the valley Apecchio. The view is beautiful with forests on the Monte Nerone, the village Apecchio and the Apennines. The estate consists of 27 hectares of forest and lawns. In total there are 4 comfortable apartments in the country house. Each apartment has a private terrace. The decor is elegant and simple with warm wood tones. Outside is a barbecue and old wood courts where you can make pizzas. In the pool you can take a refreshing dip. The pool has hydromassage and is surrounded by a green garden where you can relax in the shade of the elms. On the grounds of the country house you can make an ecological walk between plants and broom. Furthermore, there are possibilities to make bike tours (with qualified guides) on the hills of the Monte Nerone, through caves and gorges. For mountain lovers; You can enjoy hiking in the mountains Catria, Petrano and Nerone. Under clear weather you can even see the Adriatic from Monte Nerone. A great vacation home for people who love the mountains, nature and tranquility.